Libby's Little Addiction: FCD Blog HOP: Autumn Creations using Mesh! FCD Blog HOP: Autumn Creations using Mesh! Remember my last post, I mentioned the AWESOME companies that donated to our Austin Shoebox Swap? Well one such company was one you all know I love - FireCracker Designs by Pamela! Oh how I love sweet Pamela!! You know, I don't know if I ever fully told you what I'm up to with FCD these days - I think I only linked to the announcement on Pam's blog. I am no longer on her design team, it was only a one year gig. But she invited me to stay on as part of her "Creative Council" - I'm officially in charge of her guest designer schedule (have you checked out the fabulous Karen this month?? ), I share FCD card ideas on Facebook & Twitter that I find on SCS or various blogs (look for FCDStamps on Twitter!! ), and I occasionally spew ideas at her for new stamp sets (which she sometimes listens to and sometimes ignores, LOL!). There are no stamping "obligations" on this gig, because as you've noticed my stamping time is limited these days. But I'm welcome to join her blog hops if I choose to - and of course I choose to!! So without further ado... LET ME GET TO WHAT YOU CAME HERE FOR!!! This month our theme is "Autumn Creations using Mesh!" - it was probably meant to be leafy autumny creations, but to me, autumn means HALLOWEEN! So I pulled out my sweet Witchy Kitty (which is actually called Pawsitively Frightful) and went to work. I used my purple mesh as just a background - and added some googlie eyes, like they are peeking out from behind the mesh! What do you think? Do you like it? I really think this card is missing SOMETHING, or something isn't quite right. It's the first thing I've created in ~3 weeks, so it was a struggle. I'd really love to hear what you think I should add or change. Leave me a comment, and I will actually give out MY OWN BLOG CANDY to the person with my favorite suggestion. I have a set of Pamela's sweet photopolymer Shore Birds for the winner! But I'm not the only one with blog candy - there is also a "mystery hostess" somewhere along our hop, so be sure to travel around to the blogs and leave some love, and maybe you will win Pamela's fabulous goodies!! As always, it's a circular hop, so you'll end up right back here, if this is where you started. AND - Pamela is offering a DISCOUNT CODE during this hop - enter hopidays at checkout for 15% off your order! This discount ends when the hop ends - Monday at 8pm EST. And as if all of that wasn't exciting enough - Pam also has her NEW HOLIDAY RELEASE up on the website. OMG is it ADORABLE!!! You've got to go and look at these new stamps!! Ok, enough jibber jabber, please go to PAMELA'S blog and continue hopping!! Thanks for stopping by today!! Libby why would you want to add anything? This card is adorable just like it is. You have used great contrasting colors your kitty is purrfect! I love it!! This is as cute as can be. I think you don't want it too cluttered(but you know me...less is better) Maybe you could add a dangly spider or a pumpkin behind/beside the kitty? I have been busy with my brother and gone for a week, so I have a full reader to catch up on...I was wondering where you have been...Guess what...Cole is going to have a new baby brother next spring...I am so excited! The color combo is terrific, and the kitty is so adorable! The googly eyes just the right touch for a fun, sppoky card! I don't think this sweet card needs anything...love the colors....could add "have a purr-fect halloween"...very cute! How adorable! What a fun and cute Halloween card! Love the gliterry hat! Too CUTE! OMGosh! I love those spooky eyes hanging on that mesh! Adorable! I have been not getting to blog hopping much but I love seeing your awesome works each time. I love the card. I think maybe another set of eyes or boo in a bubble above the kitty. Congrats on your new postion with FCD. You did a great job with this challenge, love how that mesh looks with the little witch kitten! I love the kitty, too! What a really neat idea on the hat. We'll miss you regular designs, but will look for more of your work in the future. Aren't these new sets the greatest? I love your card as it it! I wouldn't change a thing about it. I love the eyes you used on it, they give such character to it. Glad to see you are still around with Pam. I love it the way it is too, but I was thinking maybe a way to pop the googly eyes a little. Little black cat silhouettes? Such a cute card, I LOVE all those googly eyes! This is very cute as it is!! I really have to agree with anyone that it doesn't NEED anything! I like the pumpkin idea to give it a little orange, but I totally don't think it's necessary! Wow Libby! It's GREAT! 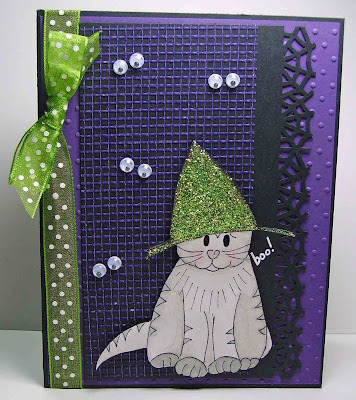 The kitten is lovely and your card fantastic with all the Halloween colors and that BORDER!!! Hi Libby~~ first off Karyn says "Happy Autumn" :D My suggestion to something missing on your card could be maybe a silhouette of an owl or bat stamped on black under the mesh where the googlie eyes are?? It does look great just as is also!! The eyes are great! I love it :) You sure did a great job on this one for having taken so much time off LOL! #1- Congrats about the Creative Counsel gig! #2- I love your card as is, it is super cute! the mesh is great! I love your kitty with the sparkly hat...and all of those googlie eyes are so cute!! Libby this is a darling card! All the googly eyes on the mesh is genius!! I wouldn't change a thing, but might add a bright really thin strip of orange or green cardstock along the cool black spiderweb edging.. either right in the middle of the solid section or just to the left of it on the mesh so as to not cover the sentiment. That would really make it pop! But honestly it is so cute as is... I truly love the eyes idea! I added a bright orange (very thin) strip along both sides of the mesh! It really pops it!